In this photo from July 2017, a package of Narcan is seen at the Walgreens on Broadway in Bangor. This pharmacy allows people to buy the drug without a prescription. Addiction experts immediately slammed the Maine Board of Pharmacy’s decision Thursday to raise to 21 the age for purchasing Narcan, which often reverses the effects of an opioid overdose. Pharmacy Board chair Joe Bruno, a Republican lawmaker from Raymond, could not reached Thursday for comment on the vote to raise the age for Narcan purchases from 18 to 21. The board’s decision appeared to come at the urging of Gov. Paul LePage, who has opposed expanding access to Narcan, the brand name of the opioid overdose antidote naloxone. The board is in the process of writing regulations to allow naloxone to be sold without a prescription. LePage opposes making Narcan more easily available and said earlier this week that Narcan access should be controlled much like cigarettes and alcohol. “That’s a drug. It should be 21,” LePage said on Maine Public Radio. But Hamilton said Narcan is not harmful even when administered to someone who is not overdosing. “Naloxone is a lifesaving thing,” she said. Even with widespread Narcan use by Maine’s first responders, opioid addiction continues to claim an average of one life a day in the state. In mid-2016 Bangor expanded the availability of Narcan by equipping its police officers with antidote. By the end of 2017, Bangor police officers had administered Narcan 86 times, police Sgt. Wade Betters said. The city’s Fire Department, which has long carried Narcan, administered it 56 times last year, according to Deputy Chief Dennis Nadeau. Although the Bangor Police Department did not have an official response to the pharmacy board’s decision, Betters said that Narcan is an indispensable tool for police officers. “We know that it saves lives and having it readily available is the key to its success,” he said. 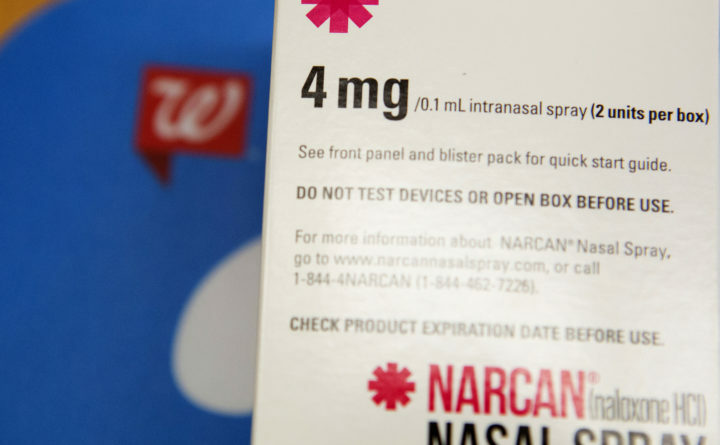 Walgreens started stocking Narcan in all of its Maine pharmacies in October. LePage has repeatedly argued that increasing access to Narcan simply discourages opioid users from getting the treatment they need to overcome their addiction.